He comes across as a type of surfing preacher. Spend some time with him and you come away feeling positive, energised and ready to take on the world. He would like to be a world champion, an Olympian, and he has been chasing his dreams for a decade or more. Sounds like any other athlete praying their ability will one day catch up to their plans, doesn't it? But 24-year-old professional surfer Cooper Chapman is no single-minded sports star wannabe. The hedonistic lifestyle of surfing all day and partying all night at some exotic location is what many imagine life on the professional surfing circuit to be. For sure, there are some surfers whose sole motivation is to live out that cliche. Chapman is not among them. "Surfing is my number one passion and my dream but I came to a realisation a little while ago that I won't be able to surf forever," Chapman said. Chapman's search for a greater purpose coincided with a tragedy that strikes too many in Australia — the impact of suicide. "It's such a silent killer in a country we all love," Chapman said. "My little sister lost two friends to suicide when she was in Year 12 last year and I was like, 'why is this happening? We need to do something about this'." He started The Good Human Factory with the single purpose of inspiring change through kindness and gratitude. "I also lost an uncle to suicide when I was about eight," Chapman said. "I can remember sitting on the couch with my dad and he was crying. It's the first time I realised what empathy was. "My dad suffered from depression but he went and sought help and he's been a real inspiration to me to share these stories to help others." 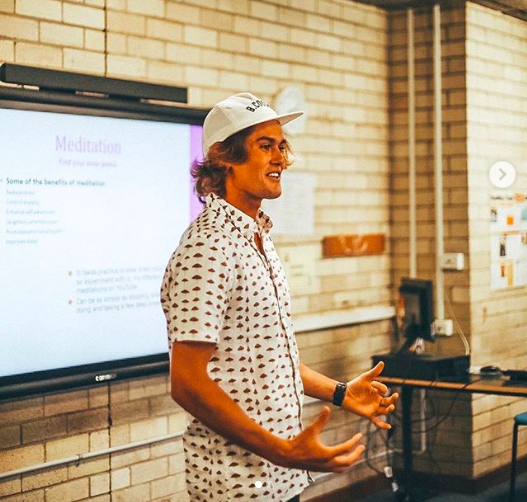 Chapman gave his first school talk recently at his old school, Narrabeen Sports High, and was encouraged by the feedback he received. "My message is, 'it's OK to talk, you are not alone'," he said. After Chapman's sister's two friends took their own lives within a fortnight of each other he began researching the issue and was shocked when he saw the statistics. An Australian dies from suicide every three hours. It is the leading cause of death for those aged 15-44. Lifeline takes almost a million calls every year. Sydney's Northern Beaches has one of the highest rates of suicide. In 2018 alone, 30 residents took their own lives. "I started The Good Human Factory just to try and spread the good word," Chapman said. "There is no guaranteed answer but the things that work for me in dealing with responsibility and pressure I hope will work for others." Chapman's timing could not have been better. The Australian Institute of Sport (AIS) recently partnered with Lifeline and put out a call to athletes who had an interest in becoming mental health advocates. "The synergy was crazy, I was literally about to apply to Lifeline Northern Beaches to train to be a volunteer and this came along," he said. Almost two dozen athletes — some of them Olympians and Paralympians — were named on Wednesday as Lifeline Community Custodians through the AIS-Lifeline partnership. Chapman is one of them. "I have had such a fortunate life and am blessed that through my sport I have a platform to reach others," he said. "I think as athletes we have a responsibility to share our stories and show that it's not all perfect … suicide and depression have been close to my heart forever and I've got this burning desire to act on it." Although Chapman is not ranked high enough to make the Australian team for surfing's debut at the Tokyo 2020 Olympics, he is aiming to be at the Paris Games four years later. "I'm actually heading to the Olympic venue in Japan in a couple of weeks to compete as part of the qualifying series and I'll check it out," he said. "My aim is still to be one of the top surfers in the world. That is my dream and I'll keep striving for that, but I know now what my purpose in life really is." Seems like a pretty good human himself. Good on him and hopefully more athletes and regular Joe's follow suit. Not just in mental health but giving those less fortunate a chop out. It's easy to get trapped in your life's bubble but reaching out and helping others can give you as good a buzz as scoring at your local with just you and your mates. Give it a go. Keep it up great stuff. This is great. Keep spreading the word, Cooper. Thanks Swellnet (and ABC) for plugging it. I also went through a really bad patch and for some reason which it totally unlike who I normally am, I had suicidal thoughts but would never act on them as I managed to get help and I could never do that to my daughters, wife and family and friends. The mind can be our own worst enemy but with help I am learning to be mindful of my thoughts and feelings. Focusing more on my feelings than negative thoughts. Best thing I could have done was getting help when I needed it most, don't feel ashamed its ok to ask. Such a big problem, two different surfers in their 40s have taken their own life's only a few hundred metres from my house, both hung themselves in their garages, both times wives or kids found them. Then a few hundred metres further down the road my friends daughter only about 19 or so took her own life. It's rarely the people you expect though, the local battlers in my area, just seem to battle on even though their lives seem to be getting worse. Also had a couple more distant friends take their own life's, sad stuff. On Indo's note re: being people you might not expect. Sydney's Northern beaches is not the lowest socioeconomic area. Interesting to know the stats on demographics with this topic. Its clear the black dog can strike anyone, anytime. Good on you Cooper. The work you're doing is far more important than surfing could ever be. Inspiring. Cooper , my son who is a very competitive 15 year old surfer has moved to trans gender and wants to compete in the women's divisions. Is there a policy on this in the WSL ?